looks like a muddy game, thanks for sharing! I hope its ok but I liked this pic so much I used it in a blog post. Its at makeyourownadventures.blogspot.com. If you want I will remove it but I thought I would let you know. i love this! especially since i really can't wait for football season right now! I love it! I like how the colors are dark and intense! Great shot. By any chance, do you know what teams were playing? The playing wearing number 10 stands exactly like an old teammate of mine. God, I love american football. beautiful. i love the scan. it give a really unique effect. I actually like the way the scan turned out, It gives it more personality. Very nice. Favorite. What film did you use >? I just shot a few rolls of B&W at a football game. 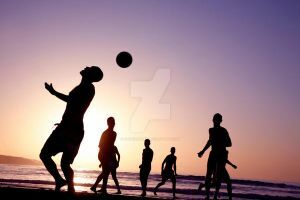 Lovin' the authentic feel, the insanely well portrayed atmosphere...Football is the best sport to play, EVER! I love how authentic (for lack of a better word) it feels. I like the border/angle too.